From French inspired elegance to modern Australian design we have the doormat to help style your home from the outside in. 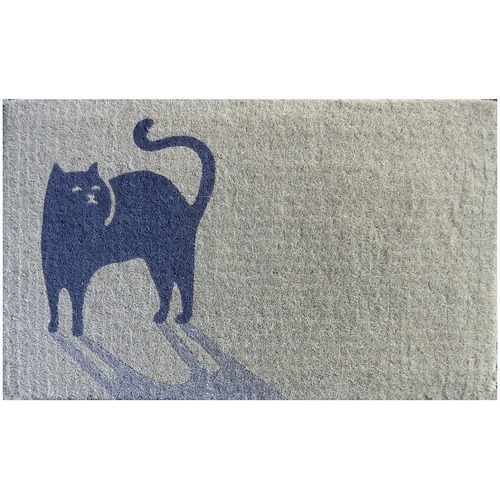 Doormat designs range includes jute and coir rugs of many sizes and styles. Handmade cotton quilts and pillow shams coordinate with rustic chests of drawers from Jaipur. Flowing through to the garden you will find iron and wood furniture and accessories such as designer rubber boots,clogs and coir garden bags. Just recently we have added a new garden range from Holland. Regular visits to India, Paris, China and Hong Kong inspire us to keep up to date with current trends to help accessorise your home. With over 20 years experience in the homewares industry we are constantly changing designs and adding new products to our range. When you buy a Cool Cat Coir Doormat online from Temple & Webster in Australia, we make it as easy as possible for you to find out when your product will be delivered to your home in Melbourne, Sydney or any major city. You can check on a delivery estimate for the Doormat Designs Part #: PD32049 here. If you have any questions about your purchase or any other Doormats product for sale our customer service representatives are available to help.Whether you just want to buy a Cool Cat Coir Doormat or shop for your entire home, Temple & Webster has a zillion things home.